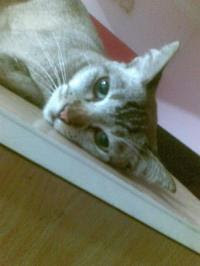 Here's my beloved cat, Cumi <3333. Haiih, she looks very tired in this picture. Hahaha. Her full name is Miss Cumi Smeagol. We gave her that name right after we watched LOTR 2. Lol. And her japanese name is Hichumi Sakamichi <3. She's a vegetarian cause whenever I pour cat food for her, she'll be eating the greens first. That means veggies. Besides that also, sometimes I see her eating grass at my house compound. Such a cow she is. Lol. I mean cat. Her favourite spot to sleep will obviously be the window. She absolutely loves basking in the sun. She just really loves the sun! Whenever theres thunders or lightnings outside, I will have to cuddle her up in my lap cause she'll always be scared whenever there are thunders and lightnings. But right, she doesn't really like to be on anyone's lap cause her bulu will mess up and she hates it. Except for masa thunders and lightnings la. She is sooo vain! Hahaha. Uhhhhh, she's a pretty cat. Compare to cute, she's more pretty. =) . Therefore, she will always be loved by ME <333!